Tag Archives for " tourists "
City commissioner Francesco Paolo Tronca issued the decree ahead of the Catholic Jubilee year, an important tourist event starting on 8 December. He is in charge of the city pending the election of a new mayor and cited security issues as well as protecting tourists from scams as the reasons for the decree. It spoke of the “inappropriate, insistent and sometimes aggressive” behaviour of Centurions, who charge between €5 and €10 ($5.3-$10.6) for a photo. They can also get tips from tour organisers for persuading tourists to go on guided trips. There have been incidents of “gladiators” attacking each other to defend their pitches at lucrative sites. That sounds pretty authentic gladiator like behavior to me ! I’d pay good money to see this again. Let’s hope they bring in Lions impersonators as well. But wait, haven’t they tried something legislating like this before. Yes siree. 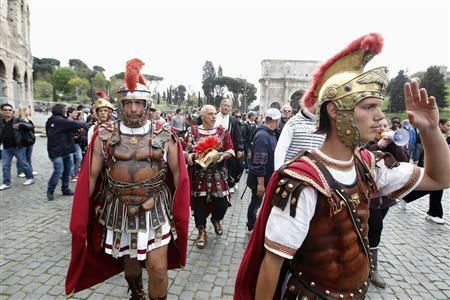 Back in 2012, there was a protest where a dozen of so centurions clashed with police where they even took over the Colossium. One ruse of the impersonators is to offer to take a photo for small Euro donation but keep the camera until they get a larger payment. Sounds just like politicians to me.